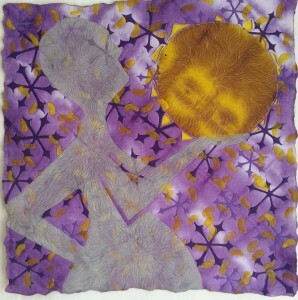 Quilt for Change recently asked me to submit a piece for their Light, Hope, and Opportunity Challenge. The project raises awareness about the Solar Sisters program, where African women entrepreneurs are given loans to start their own businesses. They buy inexpensive rechargeable solar lights to sell in their communities. This means fewer costly and dangerous kerosene lanterns in African villages. What a great cause! The exhibition will start in Geneva next month, and hopefully travel to the US. I have been thinking about burning the edges of a piece for a while, and this seemed like an excellent opportunity. Lucina was the Roman goddess of light and childbirth: She who brings children into the light. Here, the pregnant goddess holds a golden orb. The lively color scheme and bright shapes evoke a hopeful spring. This quilt is a tribute to modern-day Lucinas, our Solar Sisters, who are bringing safe, affordable, solar-powered light to their friends and neighbors. The singed edges are a reminder of the dangers of kerosene lanterns, which maim and kill users across Africa each year. 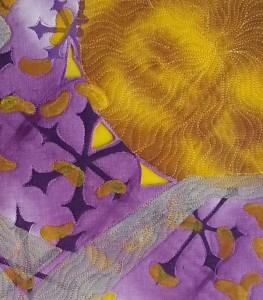 Hand-dyed, and printed linen, painted silk, layered and machine stitched. Techniques include cutwork with a burned-edge finish.